First Line: The big rotary snowblower was parked in the dark at the side of the road where the shoulder had been cleared of snow. When private investigator Owen McKenna gets a call for help from a woman who's afraid for her life, McKenna thinks she's more Looney Tunes than anything else, but she's paid in advance for his services, so he goes to see her. The woman is shot before McKenna can reach her. When he begins investigating, he's led to a couple of missing persons reports, but nothing's making sense. The only thing that ties two of the people together is an interest in Italian Renaissance art. Then another connection pops up: a man who was a football star twenty years ago, but Adam Simms is in the last stages of Traumatic Brain Injury, and McKenna is doubtful he can be of much help. Regardless of his usefulness, Simms may be the target of a very devious killer. McKenna wants him protected while he's trying to make sense of a very puzzling case. When I read one of Todd Borg's Owen McKenna books, I simply cannot turn the pages fast enough. There's always a first-class mystery to solve, new things to learn, plenty of adrenaline-pumping action to survive, and-- most of all-- a wonderful cast of characters to catch up with. As usual, the gorgeous scenery of Lake Tahoe can be considered a character in Tahoe Blue Fire, and like most characters it can sometimes be high maintenance, which is why readers get to learn a bit about the machines that remove all the snow that falls in the area, and how they get rid of the huge piles of white stuff so we can drive safely on the roads. However, if snow and machinery aren't your things, you can also pick up information on computer forensics, Traumatic Brain Injury, service dogs, and history-- from the Medicis in Italy to local Tahoe history when Frank Sinatra was in town. The story is yet another good one, although one segment that takes place away from Lake Tahoe made the story's momentum falter a bit, and the curious behavior of one of the characters clued me in to the identity of the killer too soon for my liking. Tiny blips on my radar however, because Tahoe Blue Fire is packed with goodies. As usual, Borg's wonderful cast of characters provide the majority of those goodies. Owen McKenna has a great supporting cast: two buddies on the local police and sheriff's departments; a love interest with a brilliant mind of her own; and Owen's constant companion, a Harlequin Great Dane named Spot who wears a faux diamond stud in one ear. Spot is fantastic-- one of my favorite dogs in literature. Spot is a well-trained dog that helps out whenever and wherever he can, but the thing I love about him most is that Spot isn't Super Dog; he doesn't go around spelling "Help!" in the mashed potatoes. Mostly he wags a lot. And watches you eat. Spot's a typical dog that makes a difference each and every day, just like a lot of other dogs. When it comes to characterization, Borg knows that the best kind is most often found in small but telling details. It's the fact that McKenna gets himself into a lot of dangerous situations, yet he doesn't carry a gun. It's the fact that he has a key to his girlfriend's house, but only uses it when she tells him to. It's the fact that McKenna feels guilty because he didn't take his client more seriously and she was killed as a result. And it's the fact that he takes the time to show a young K-9 officer how to care for his stressed-out dog. The entire Owen McKenna series is filled with moments-- facts-- like this, and as a result, this reader has come to care deeply for these characters. If you see that this is the thirteenth book in the series, and you just don't feel like investing in something this long, I hope you'll reconsider. 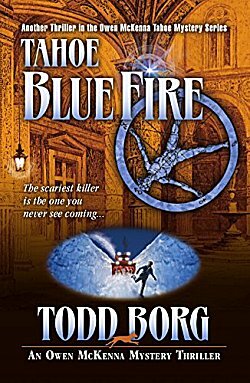 You'll find that Tahoe Blue Fire reads very well as a standalone. If you're the type of reader (like me) who loves good stories and characters who feel like a part of your family, you'll be glad you've found a series with some meat on its bones. Either way you look at it, this series is one of my favorites, and I recommend it highly. Oh, the Tahoe setting is a draw for me, too, Cathy. And this is a series I've not yet dipped into, so I will need to remedy that, I think. You *definitely* need to remedy that, Margot!